First published in 1999, this celebrated history of San Francisco traces the exploitation of both local and distant regions by prominent families—the Hearsts, de Youngs, Spreckelses, and others—who gained power through mining, ranching, water and energy, transportation, real estate, weapons, and the mass media. The story uncovered by Gray Brechin is one of greed and ambition on an epic scale. Brechin arrives at a new way of understanding urban history as he traces the connections between environment, economy, and technology and discovers links that led, ultimately, to the creation of the atomic bomb and the nuclear arms race. 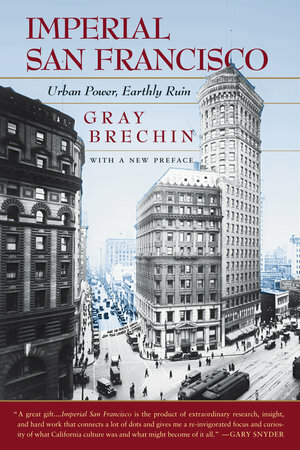 In a new preface, Brechin considers the vulnerability of cities in the post-9/11 twenty-first century. 5. The Hearsts: Racial Supremacy and the Digestion of "All Mexico"
7. The University, the Gate, and "the Gadget"